September 4 is the 247th day of the year(248th in leap years) in the Gregorian calendar.There are 118 days remaining until the end of the year. A leap year is a calendar year containing one additional day added to keep the calendar year synchronized with the astronomical or seasonal year. Because seasons and astronomical events do not repeat in a whole number of days, calendars that have the same number of days in each year drift over time with respect to the event that the year is supposed to track. By inserting an additional day or month into the year, the drift can be corrected. A year that is not a leap year is called a common year. Every year that is exactly divisible by four is a leap year, except for years that are exactly divisible by 100, but these centurial years are leap years if they are exactly divisible by 400. For example, the years 1700, 1800, and 1900 are not leap years, but the year 2000 is. 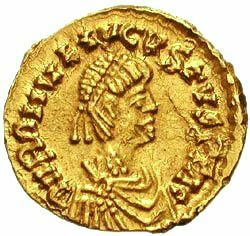 476 – Romulus Augustulus, last emperor of the Western Roman Empire, is deposed when Odoacer proclaims himself "King of Italy", thus ending the Western Roman Empire. 626 – Li Shimin, posthumously known as Emperor Taizong of Tang, assumes the throne over the Tang dynasty of China. 929 – Battle of Lenzen: Slavic forces (the Redarii and the Obotrites) are defeated by a Saxon army near the fortified stronghold of Lenzen in Brandenburg. 1260 – The Sienese Ghibellines, supported by the forces of Manfred, King of Sicily, defeat the Florentine Guelphs at Montaperti. 1282 – Peter III of Aragon becomes the King of Sicily. 1479 – The Treaty of Alcáçovas is signed by the Catholic Monarchs of Castile and Aragon on one side and Afonso V and his son, Prince John of Portugal. 1607 – The Flight of the Earls takes place in Ireland. 1666 – In London, England, the most destructive damage from the Great Fire occurs. 1774 – New Caledonia is first sighted by Europeans, during the second voyage of Captain James Cook. 1781 – Los Angeles is founded as El Pueblo de Nuestra Señora La Reina de los Ángeles (The Village of Our Lady, the Queen of the Angels) by 44 Spanish settlers. 1797 – Coup of 18 Fructidor in France. 1800 – The French garrison in Valletta surrenders to British troops who had been called at the invitation of the Maltese. The islands of Malta and Gozo become the Malta Protectorate. 1812 – War of 1812: The Siege of Fort Harrison begins when the fort is set on fire. 1839 – Battle of Kowloon: British vessels open fire on Chinese war junks enforcing a food sales embargo on the British community in China in the first armed conflict of the First Opium War. 1862 – American Civil War Maryland Campaign: General Robert E. Lee takes the Army of Northern Virginia, and the war, into the North. 1870 – Emperor Napoleon III of France is deposed and the Third Republic is declared. 1882 – The Pearl Street Station in New York City becomes the first power plant to supply electricity to paying customers. 1886 – American Indian Wars: After almost 30 years of fighting, Apache leader Geronimo, with his remaining warriors, surrenders to General Nelson Miles in Arizona. 1888 – George Eastman registers the trademark Kodak and receives a patent for his camera that uses roll film. 1919 – Mustafa Kemal Atatürk, who founded the Republic of Turkey, gathers a congress in Sivas to make decisions as to the future of Anatolia and Thrace. 1923 – Maiden flight of the first U.S. airship, the USS Shenandoah. 1939 – World War II: William J. Murphy commands the first Royal Air Force attack on Germany. 1941 – World War II: A German submarine makes the first attack of the war against a United States warship, the USS Greer. 1944 – World War II: The British 11th Armoured Division liberates the Belgian city of Antwerp. 1944 – World War II: Finland exits from the war with Soviet Union. 1948 – Queen Wilhelmina of the Netherlands abdicates for health reasons. 1949 – The Peekskill riots erupt after a Paul Robeson concert in Peekskill, New York. 1950 – Darlington Raceway is the site of the inaugural Southern 500, the first 500-mile NASCAR race. 1951 – The first live transcontinental television broadcast takes place in San Francisco, from the Japanese Peace Treaty Conference. 1957 – American Civil Rights Movement: Little Rock Crisis: Orval Faubus, governor of Arkansas, calls out the National Guard to prevent African American students from enrolling in Central High School. 1957 – The Ford Motor Company introduces the Edsel. 1963 – Swissair Flight 306 crashes near Dürrenäsch, Switzerland, killing all 80 people on board. 1964 – Scotland's Forth Road Bridge near Edinburgh officially opens. 1967 – Vietnam War: Operation Swift begins when U.S. Marines engage the North Vietnamese in battle in the Que Son Valley. 1970 – Salvador Allende is elected President of Chile. 1971 – Alaska Airlines Flight 1866 crashes near Juneau, Alaska, killing all 111 people on board. 1972 – Mark Spitz becomes the first competitor to win seven medals at a single Olympic Games. 1972 – The Price Is Right premieres on CBS. As of 2018, it is the longest running game show on American television. 1975 – The Sinai Interim Agreement relating to the Arab–Israeli conflict is signed. 1977 – The Golden Dragon massacre takes place in San Francisco. 1985 – The discovery of Buckminsterfullerene, the first fullerene molecule of carbon. 1989 – In Leipzig, East Germany, the first of weekly demonstration for the legalisation of opposition groups and democratic reforms takes place. 1996 – War on Drugs: Revolutionary Armed Forces of Colombia (FARC) attack a military base in Guaviare, starting three weeks of guerrilla warfare in which at least 130 Colombians are killed. 1998 – Google is founded by Larry Page and Sergey Brin, two students at Stanford University. 2001 – Tokyo DisneySea opens to the public as part of the Tokyo Disney Resort in Urayasu, Chiba, Japan. 2002 – The Oakland Athletics win their 20th consecutive game, an American League record. 2007 – Three terrorists suspected to be a part of Al-Qaeda are arrested in Germany after allegedly planning attacks on both the Frankfurt International airport and US military installations. 2010 – A 7.1 magnitude earthquake strikes the South Island of New Zealand causing widespread damage and several power outages. Year 476 (CDLXXVI) was a leap year starting on Thursday of the Julian calendar. At the time, it was known as the Year of the Consulship of Basiliscus and Armatus. The denomination 476 for this year has been used since the early medieval period, when the Anno Domini calendar era became the prevalent method in Europe for naming years. Flavius Romulus Augustus, known derisively and historiographically as Romulus Augustulus, was the Roman emperor who ruled the Western Roman Empire from 31 October 475 until 4 September 476. 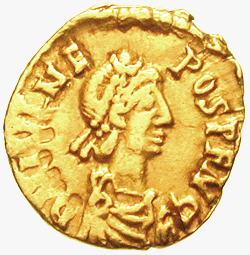 He is often described as the "last Western Roman emperor", though some historians consider this to be Julius Nepos. His deposition by Odoacer traditionally marks the end of the Roman Empire in the West, the end of Ancient Rome, and the beginning of the Middle Ages in Western Europe. In historiography, the Western Roman Empire refers to the western provinces of the Roman Empire at any time during which they were administered by a separate independent Imperial court; in particular, this term is used to describe the period from 395 to 476, where there were separate coequal courts dividing the governance of the empire in the Western and the Eastern provinces, with a distinct imperial succession in the separate courts. The terms Western Roman Empire and Eastern Roman Empire are modern descriptions that describe political entities that were de facto independent; contemporary Romans did not consider the Empire to have been split into two separate empires but viewed it as a single polity governed by two separate imperial courts as an administrative expediency. The Western Roman Empire collapsed in 476, and the Western imperial court was formally dissolved in 480. The Eastern imperial court survived until 1453. Year 973 (CMLXXIII) was a common year starting on Wednesday of the Julian calendar. Abū Rayḥān Muḥammad ibn Aḥmad Al-Bīrūnī (973–1050), known as Al-Biruni in English, was an Iranian scholar and polymath. He was from Khwarazm – a region which encompasses modern-day western Uzbekistan, and northern Turkmenistan. Year 1241 (MCCXLI) was a common year starting on Tuesday of the Julian calendar. Year 422 (CDXXII) was a common year starting on Sunday of the Julian calendar. At the time, it was known as the Year of the Consulship of Honorius and Theodosius. The denomination 422 for this year has been used since the early medieval period, when the Anno Domini calendar era became the prevalent method in Europe for naming years. Pope Boniface I was Pope from 28 December 418 to his death in 422. His election was disputed by the supporters of Eulalius, until the dispute was settled by the Emperor. Boniface was active maintaining church discipline and he restored certain privileges to the metropolitical sees of Narbonne and Vienne, exempting them from any subjection to the primacy of Arles. He was a contemporary of Saint Augustine of Hippo, who dedicated to him some of his works. Year 799 (DCCXCIX) was a common year starting on Tuesday of the Julian calendar. The denomination 799 for this year has been used since the early medieval period, when the Anno Domini calendar era became the prevalent method in Europe for naming years. Saint Hermione of Ephesus is a 2nd-century Christian martyr venerated by the Roman Catholic and Eastern Orthodox churches. Saint Ida of Herzfeld was the widow of a Saxon duke who devoted her life to the poor following the death of her husband in 811. Her feast day is September 4. Saint Irmgardis, Saint Irmgard of Süchteln was a medieval saint and sovereign Countess Irmgardis of Aspel (Germany) in 1013-1085. Her relics are preserved in sarcophagus in the altar of Cologne Cathedral. Saint Candida the Elder was an early Christian saint and resident of Naples, Italy. The elderly Hebrew woman was cured of an illness by Saint Peter and converted to Christianity. She was baptized by Peter and later converted by Aspren, the first bishop of Naples, to Christianity. BlessedCatherine of Racconigi, T.O.S.D., was an Italian member of the Third Order of St. Dominic, who is recognized for being a mystic and a stigmatic. Blessed Dina Bélanger - in religious Marie of Saint Cecilia of Rome - was a Canadian professed religious and a professed member from the Religieuses de Jésus-Marie. Bélanger was a noted musician and learnt the piano from her late childhood while teaching this later in her life though a period of ill health ceased this; successive bouts of poor health never hindered her spiritual or musical aspirations though weakened her due to contracting tuberculosis. Her biographical account - spanning from 1924 until just a couple of months prior to her death - details her spiritual encounters with Jesus Christ in a series of visions. August 1 is the 213th day of the year in the Gregorian calendar. There are 152 days remaining until the end of the year. August 8 is the 220th day of the year in the Gregorian calendar. There are 145 days remaining until the end of the year. August 12 is the 224th day of the year in the Gregorian calendar. There are 141 days remaining until the end of the year. August 5 is the 217th day of the year in the Gregorian calendar. There are 148 days remaining until the end of the year. August 10 is the 222nd day of the year in the Gregorian calendar. There are 143 days remaining until the end of the year. February 6 is the 37th day of the year in the Gregorian calendar. There are 328 days remaining until the end of the year. July 23 is the 204th day of the year in the Gregorian calendar. There are 161 days remaining until the end of the year. May 13 is the 133rd day of the year in the Gregorian calendar. There are 232 days remaining until the end of the year. May 14 is the 134th day of the year in the Gregorian calendar. There are 231 days remaining until the end of the year. March 21 is the 80th day of the year in the Gregorian calendar. There are 285 days remaining until the end of the year. November 22 is the 326th day of the year in the Gregorian calendar. There are 39 days remaining until the end of the year. November 5 is the 309th day of the year in the Gregorian calendar. There are 56 days remaining until the end of the year. November 7 is the 311th day of the year in the Gregorian calendar. There are 54 days remaining until the end of the year. October 10 is the 283rd day of the year in the Gregorian calendar. There are 82 days remaining until the end of the year. October 5 is the 278th day of the year in the Gregorian calendar. There are 87 days remaining until the end of the year. October 8 is the 281st day of the year in the Gregorian calendar. There are 84 days remaining until the end of the year. September 14 is the 257th day of the year in the Gregorian calendar. There are 108 days remaining until the end of the year. September 5 is the 248th day of the year in the Gregorian calendar. There are 117 days remaining until the end of the year. August 20 is the 232nd day of the year in the Gregorian calendar. There are 133 days remaining until the end of the year. April 4 is the 94th day of the year in the Gregorian calendar. There are 271 days remaining until the end of the year. ↑ "Notable Deaths in 2018". CBS News Sunday Morning. Retrieved 2018-09-12. Wikimedia Commons has media related to September 4 .